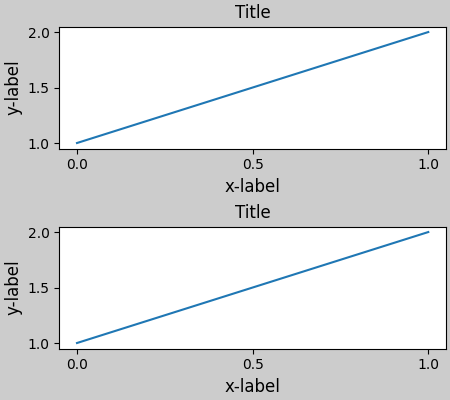 How to use constrained-layout to fit plots within your figure cleanly. constrained_layout automatically adjusts subplots and decorations like legends and colorbars so that they fit in the figure window while still preserving, as best they can, the logical layout requested by the user. constrained_layout is similar to tight_layout, but uses a constraint solver to determine the size of axes that allows them to fit. Those are described in detail throughout the following sections. Currently Constrained Layout is experimental. The behaviour and API are subject to change, or the whole functionality may be removed without a deprecation period. 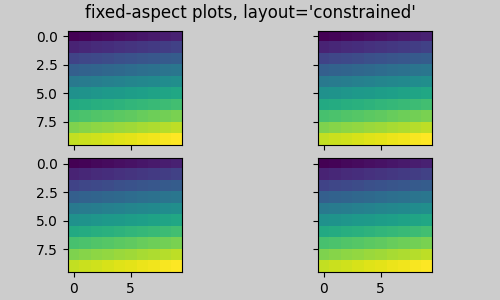 If you require your plots to be absolutely reproducible, get the Axes positions after running Constrained Layout and use ax.set_position() in your code with constrained_layout=False. To prevent this, the location of axes needs to be adjusted. 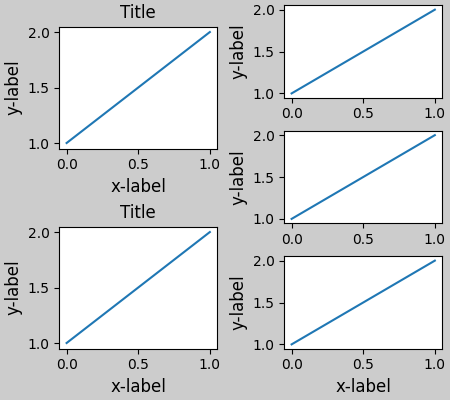 For subplots, this can be done by adjusting the subplot params (Move the edge of an axes to make room for tick labels). However, specifying your figure with the constrained_layout=True kwarg will do the adjusting automatically. Specifying constrained_layout=True in the call to plt.subplots causes the layout to be properly constrained. If you create a colorbar with the colorbar() command you need to make room for it. constrained_layout does this automatically. Note that if you specify use_gridspec=True it will be ignored because this option is made for improving the layout via tight_layout. For the pcolormesh kwargs (pc_kwargs) we use a dictionary. 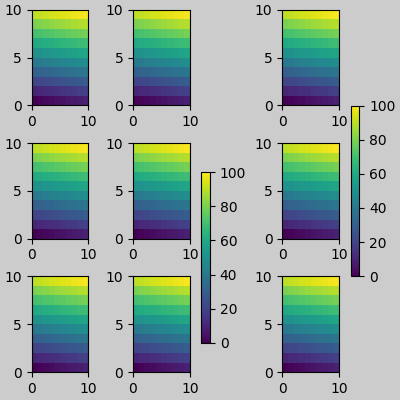 Below we will assign one colorbar to a number of axes each containing a ScalarMappable; specifying the norm and colormap ensures the colorbar is accurate for all the axes. If you specify a list of axes (or other iterable container) to the ax argument of colorbar, constrained_layout will take space from the specified axes. 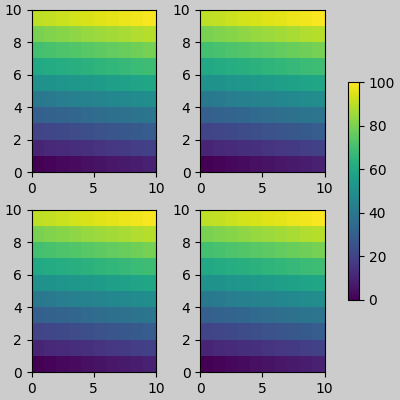 If you specify a list of axes from inside a grid of axes, the colorbar will steal space appropriately, and leave a gap, but all subplots will still be the same size. Note that there is a bit of a subtlety when specifying a single axes as the parent. 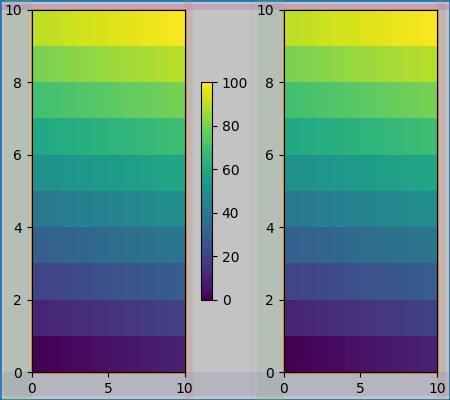 In the following, it might be desirable and expected for the colorbars to line up, but they don't because the colorbar paired with the bottom axes is tied to the subplotspec of the axes, and hence shrinks when the gridspec-level colorbar is added. constrained_layout can also make room for suptitle. Legends can be placed outside of their parent axis. Constrained-layout is designed to handle this for Axes.legend(). However, constrained-layout does not handle legends being created via Figure.legend() (yet). In order for a legend or other artist to not steal space from the subplot layout, we can leg.set_in_layout(False). 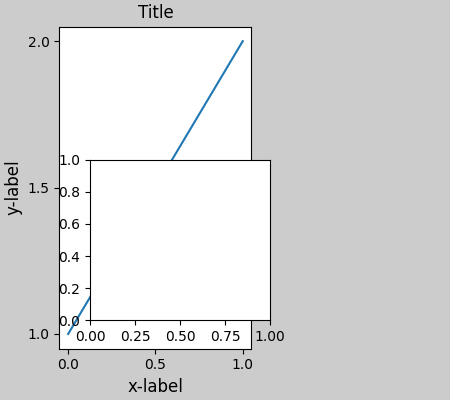 Of course this can mean the legend ends up cropped, but can be useful if the plot is subsequently called with fig.savefig('outname.png', bbox_inches='tight'). Note, however, that the legend's get_in_layout status will have to be toggled again to make the saved file work, and we must manually trigger a draw if we want constrained_layout to adjust the size of the axes before printing. # we want the legend included in the bbox_inches='tight' calcs. # we don't want the layout to change at this point. 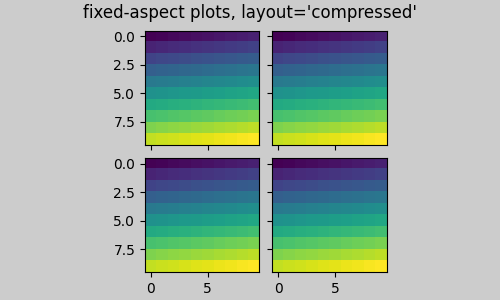 Spacing between subplots is set by wspace and hspace. 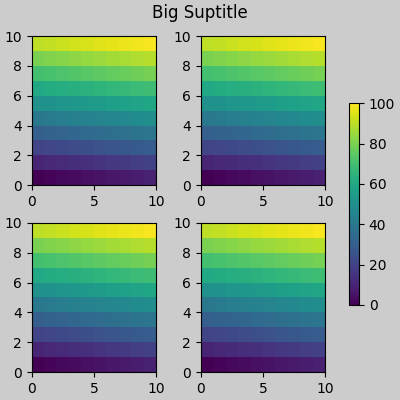 There are specified as a fraction of the size of the subplot group as a whole. If the size of the figure is changed, then these spaces change in proportion. Note in the blow how the space at the edges doesn't change from the above, but the space between subplots does. Colorbars will be placed wspace and hsapce apart from other subplots. The padding between the colorbar and the axis it is attached to will never be less than w_pad (for a vertical colorbar) or h_pad (for a horizontal colorbar). Note the use of the pad kwarg here in the colorbar call. It defaults to 0.02 of the size of the axis it is attached to. 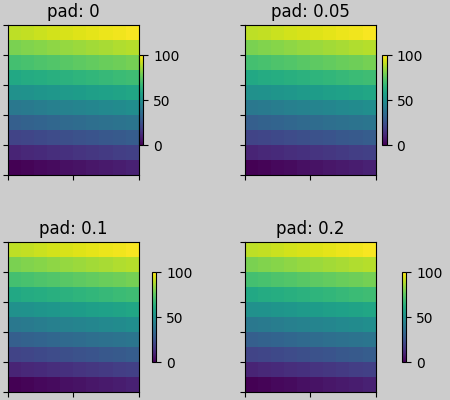 In the above example, the colorbar will not ever be closer than 2 pts to the plot, but if we want it a bit further away, we can specify its value for pad to be non-zero. w_pad, h_pad: Padding around axes objects. 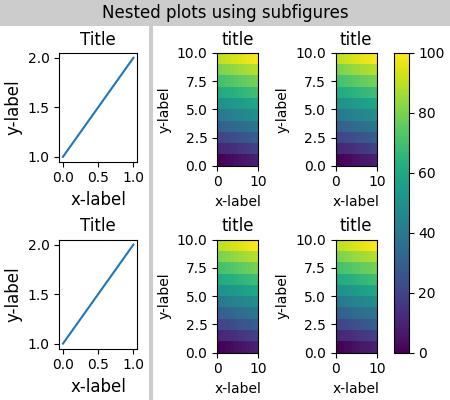 wspace, hspace: Space between subplot groups. 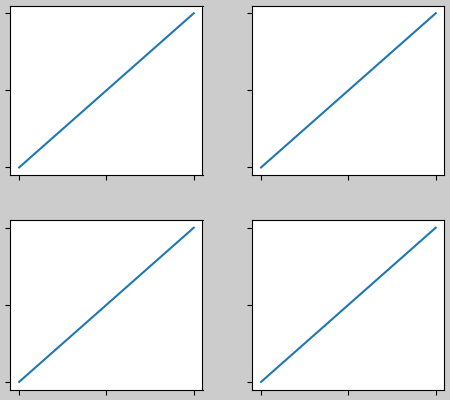 Float representing a fraction of the subplot widths being separated. 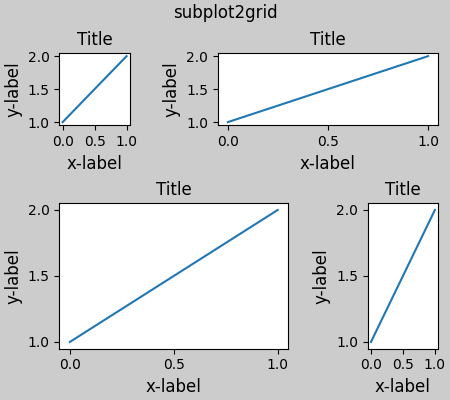 Default is 0.02.
constrained_layout is meant to be used with subplots() or GridSpec() and add_subplot(). More complicated gridspec layouts are possible. Note here we use the convenience functions add_gridspec and subgridspec. This example uses two gridspecs to have the colorbar only pertain to one set of pcolors. Note how the left column is wider than the two right-hand columns because of this. 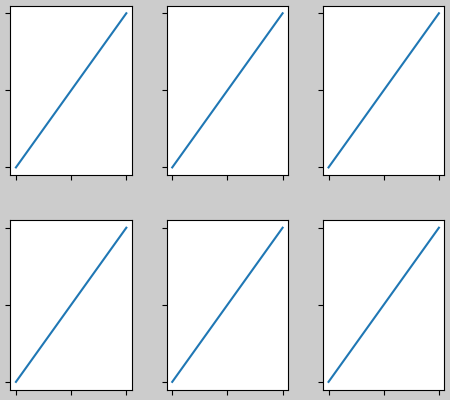 Of course, if you wanted the subplots to be the same size you only needed one gridspec. There can be good reasons to manually set an axes position. A manual call to set_position will set the axes so constrained_layout has no effect on it anymore. (Note that constrained_layout still leaves the space for the axes that is moved). If you want an inset axes in data-space, you need to manually execute the layout using fig.execute_constrained_layout() call. The inset figure will then be properly positioned. However, it will not be properly positioned if the size of the figure is subsequently changed. Similarly, if the figure is printed to another backend, there may be slight changes of location due to small differences in how the backends render fonts. constrained_layout usually adjusts the axes positions on each draw of the figure. If you want to get the spacing provided by constrained_layout but not have it update, then do the initial draw and then call fig.set_constrained_layout(False). This is potentially useful for animations where the tick labels may change length. Note that constrained_layout is turned off for ZOOM and PAN GUI events for the backends that use the toolbar. This prevents the axes from changing position during zooming and panning. 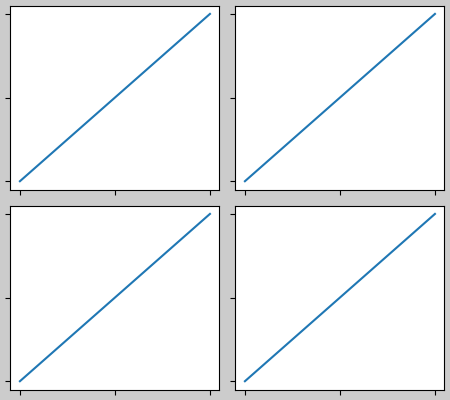 Similarly, subplot2grid() doesn't work for the same reason: each call creates a different parent gridspec. 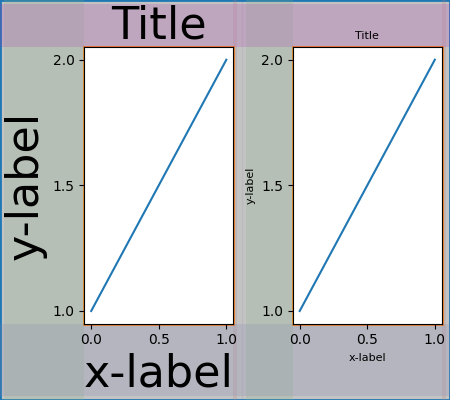 constrained_layout only considers ticklabels, axis labels, titles, and legends. Thus, other artists may be clipped and also may overlap. There are small differences in how the backends handle rendering fonts, so the results will not be pixel-identical. There was not enough room for the elements you were requesting to draw. 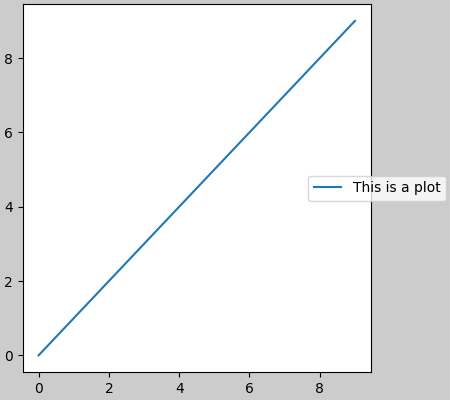 There is a bug - in which case open an issue at https://github.com/matplotlib/matplotlib/issues. If there is a bug, please report with a self-contained example that does not require outside data or dependencies (other than numpy). The algorithm for the constraint is relatively straightforward, but has some complexity due to the complex ways we can layout a figure. Each item has a layoutbox associated with it. 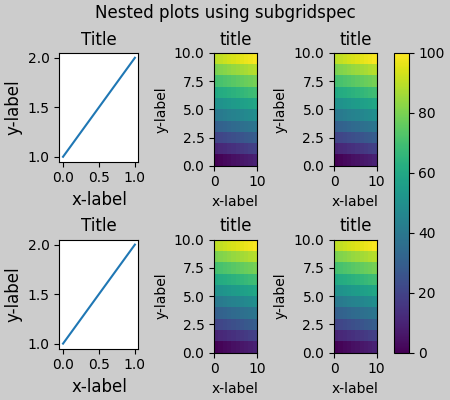 The nesting of gridspecs created with GridSpecFromSubplotSpec can be arbitrarily deep. 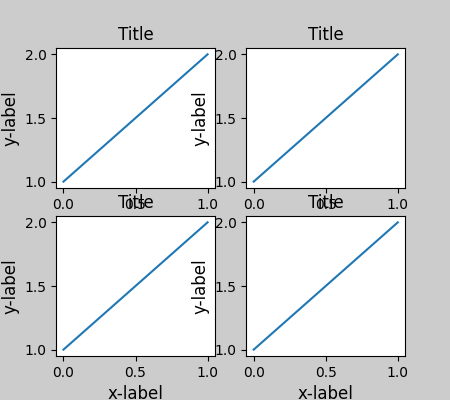 Each Axes has two layoutboxes. 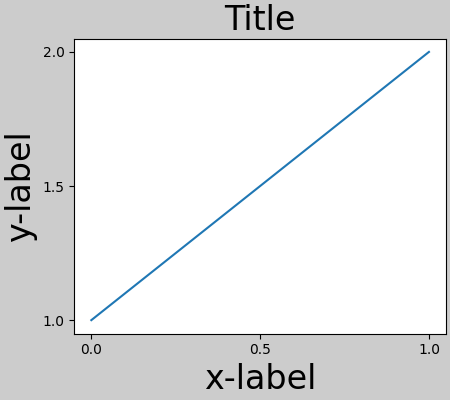 The first one, ax._layoutbox represents the outside of the Axes and all its decorations (i.e. ticklabels,axis labels, etc.). The second layoutbox corresponds to the Axes' ax.position, which sets where in the figure the spines are placed. Why so many stacked containers? Ideally, all that would be needed are the Axes layout boxes. For the Gridspec case, a container is needed if the Gridspec is nested via GridSpecFromSubplotSpec. At the top level, it is desirable for symmetry, but it also makes room for suptitle. 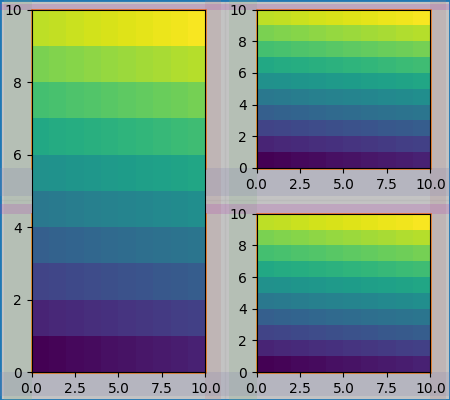 For the Subplotspec/Axes case, Axes often have colorbars or other annotations that need to be packaged inside the Subplotspec, hence the need for the outer layer. For a single Axes the layout is straight forward. 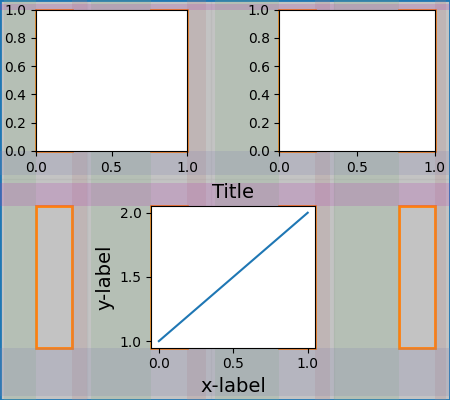 The Figure and outer Gridspec layoutboxes coincide. 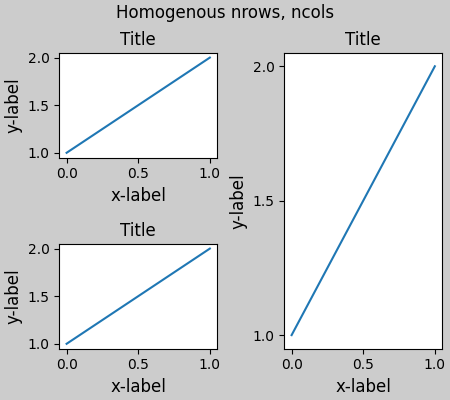 The Subplotspec and Axes boxes also coincide because the Axes has no colorbar. Note the difference between the red pos box and the green ax box is set by the size of the decorations around the Axes. 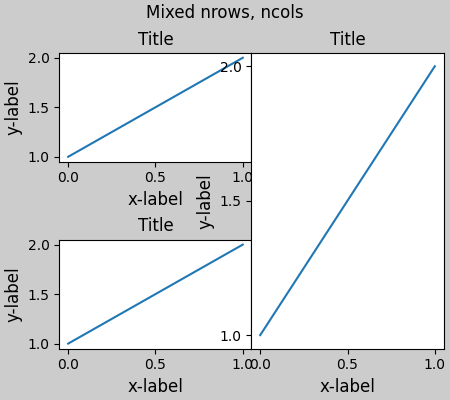 For this case, the Axes layoutboxes and the Subplotspec boxes still co-incide. However, because the decorations in the right-hand plot are so much smaller than the left-hand, so the right-hand layoutboxes are smaller. The Subplotspec boxes are laid out in the code in the subroutine arange_subplotspecs(), which simply checks the subplotspecs in the code against one another and stacks them appropriately. 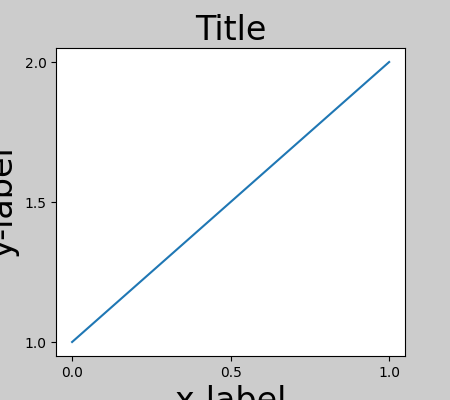 The two pos axes are lined up. Because they have the same minimum row, they are lined up at the top. Because they have the same maximum row they are lined up at the bottom. In the code this is accomplished via the calls to layoutbox.align. 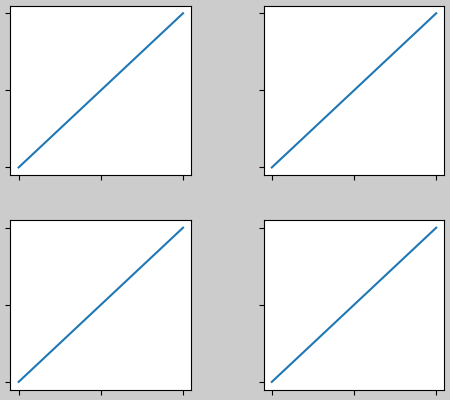 If there was more than one row, then the same horizontal alignment would occur between the rows. 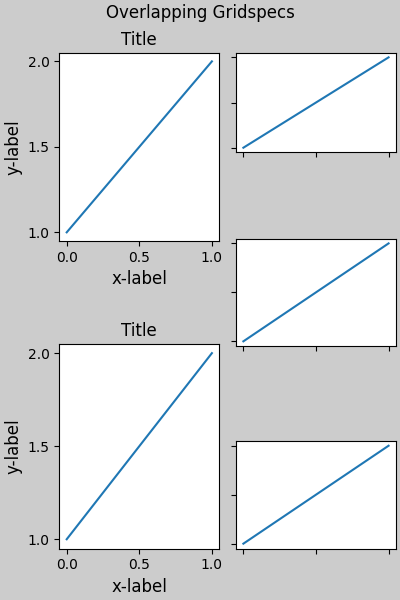 The two pos axes are given the same width because the subplotspecs occupy the same number of columns. This is accomplished in the code where dcols0 is compared to dcolsC. If they are equal, then their widths are constrained to be equal. 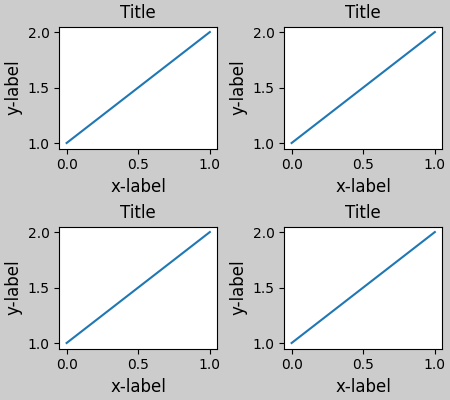 While it is a bit subtle in this case, note that the division between the Subplotspecs is not centered, but has been moved to the right to make space for the larger labels on the left-hand plot. 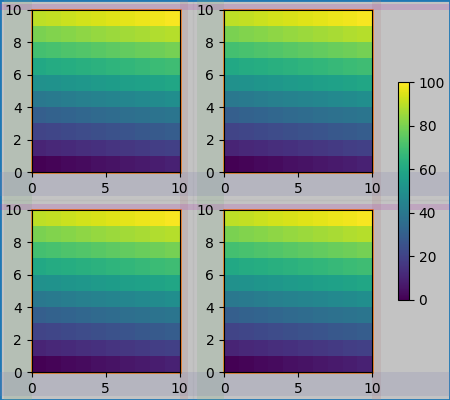 Adding a colorbar makes it clear why the Subplotspec layoutboxes must be different from the axes layoutboxes. Here we see the left-hand subplotspec has more room to accommodate the colorbar, and that there are two green ax boxes inside the ss box. 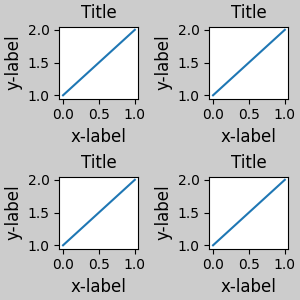 Note that the width of the pos boxes is still the same because of the constraint on their widths because their subplotspecs occupy the same number of columns (one in this example). The colorbar layout logic is contained in make_axes which calls _constrained_layout.layoutcolorbarsingle() for cbars attached to a single axes, and _constrained_layout.layoutcolorbargridspec() if the colorbar is associated with a gridspec. 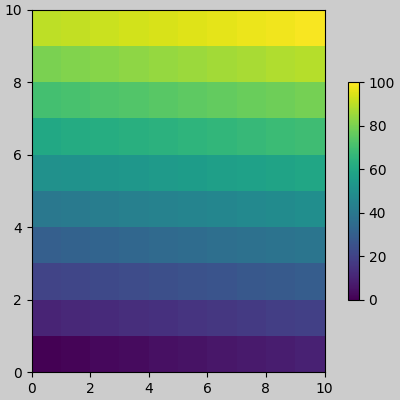 This example shows the Subplotspec layoutboxes being made smaller by a colorbar layoutbox. The size of the colorbar layoutbox is set to be shrink smaller than the vertical extent of the pos layoutboxes in the gridspec, and it is made to be centered between those two points. 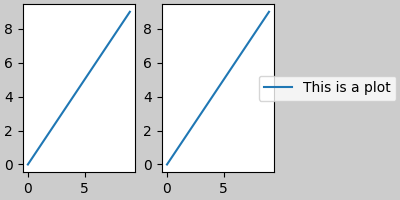 There are two ways to make axes have an uneven size in a Gridspec layout, either by specifying them to cross Gridspecs rows or columns, or by specifying width and height ratios. The first method is used here. The constraint that makes the heights be correct is in the code where drowsC < drows0 which in this case would be 1 is less than 2. So we constrain the height of the 1-row Axes to be less than half the height of the 2-row Axes. This algorithm can be wrong if the decorations attached to the smaller axes are very large, so there is an unaccounted-for edge case. 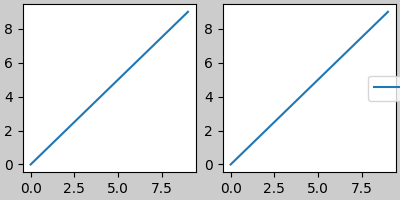 Height and width ratios are accommodated with the same part of the code with the smaller axes always constrained to be less in size than the larger. The final piece of the code that has not been explained is what happens if there is an empty gridspec opening. In that case a fake invisible axes is added and we proceed as before. The empty gridspec has no decorations, but the axes position in made the same size as the occupied Axes positions. This is done at the start of _constrained_layout.do_constrained_layout() (hassubplotspec). The layout is called only once. This is OK if the original layout was pretty close (which it should be in most cases). However, if the layout changes a lot from the default layout then the decorators can change size. In particular the x and ytick labels can change. If this happens, then we should probably call the whole routine twice.